Pure Design Dentistry (Chicago) - Book Appointment Online! We accept ALL PPO Dental Plans. Dr Aaron Diehl, Chicago Dentist, and the staff at Pure Design Dentisty offers patients the highest quality patient care in Lincoln Park. Pure Design Dentistry uses state of the art digital X-rays, Internet based software and paperless eco-friendly business systems. We have private treatment rooms, HDTV in every room, Invisalign clear braces and in-office whitening. Pure Convenience Pure Design Dentistry is conveniently located on Clybourn between North Avenue and Willow St. Street parking is available. Our Clybourn dental office is a short walk north from the Red Line on Clybourn. 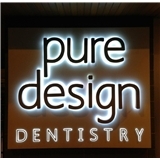 Pure Design Dentistry was designed by the Italian architect and designer, Antonio Pio Saracino. This dental office design is unlike any dental practice in Chicago. Dr Aaron Diehl commissioned this design to reflect his talents and dental expertise unique to Chicago . Dr. Diehl and his staff were incredibly warm and welcoming. Absolutely everything was explained in great detail and throughout my appointment they really made sure I fully understood in depth all that was going on. As with many people Dentists aren't always my favourite health care providers to go to but everyone at Pure Design Dentistry provided me with one of the best dental experiences I've ever had always making sure I felt comfortable throughout the appointment. I would highly recommend them!